Well, it’s finally time again! The referees for Matchweek 1 (Saturday, August 16 through Monday, August 18) in the English Premier League have been announced and we’re off to the proverbial races! Mike Dean will handle Manchester United’s first match of the Louis Van Gaal era against Swansea, and Martin Atkinson takes defending champions Manchester City’s first game against Newcastle on Sunday. New kids Leicester play Everton with Mike Jones in the center, and wonderboy Michael Oliver gets Burnley when they debut against Chelsea. 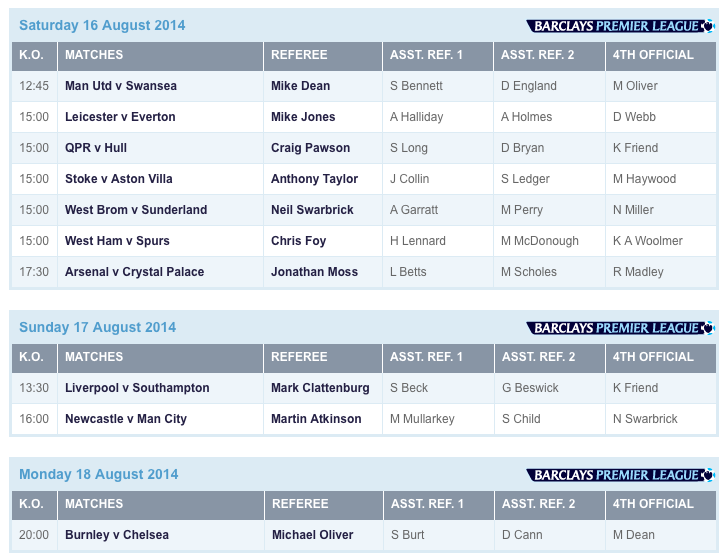 Finally, my Spurs open our season against West Ham with Chris Foy as referee. While that normally wouldn’t be cause for much celebration, it does mean we get the ridiculously dreamy Harry Lennard as assistant referee, a trade off I gladly accept. This is an awesome photo of Clatts.